Somewhat surprisingly, there is no clear definition of what it means to be "investing in the organizational capacity" of nonprofits, because capacity building can encompass anything from nonprofit board training, to installing a computer network. Capacity building is whatever is needed to bring a nonprofit to the next level of operational, programmatic, financial, or organizational maturity, in order to more effectively and efficiently fulfill its mission. In 2010, TRP received a HRSA Network Development grant to provide 48 rotations for medical residents in 14 rural Tennessee counties and concurrently encourage the recruitment of rural physicians by promoting maximum exposure to rural life. The network development activities produced 104 completed rotations. The activities also resulted in additional partnerships, the inclusion of non-physician primary care health providers, and “pipeline” activities involving high school students. Early into the grant activities, it became apparent that exposure needed to be provided for non-physician primary care providers and future providers. The holidays, including the upcoming New Year, are exciting times! For many of you, it may be the end of the fiscal year for your network. As you prepare for annual reporting to your board and members, I bet you are also thinking about what you want to do differently in 2015. No matter when your reporting period ends, we all make resolutions to do certain things differently, better, or more in the new calendar year. While thinking about your reporting and resolutions, I hope that you make a resolution to take time to sit a spell, rest a bit during this hectic time of the year, and reflect on 2014. Christy will be available on December 29th and 30th. The Summit agenda has been updated and features excellent speakers and topics ranging from Board Dynamics to Capacity Building. NOTE: The deadline to make hotel reservations is December 23rd or when all rooms have sold. Make your reservations today! This address change will be effective January 1, 2015. 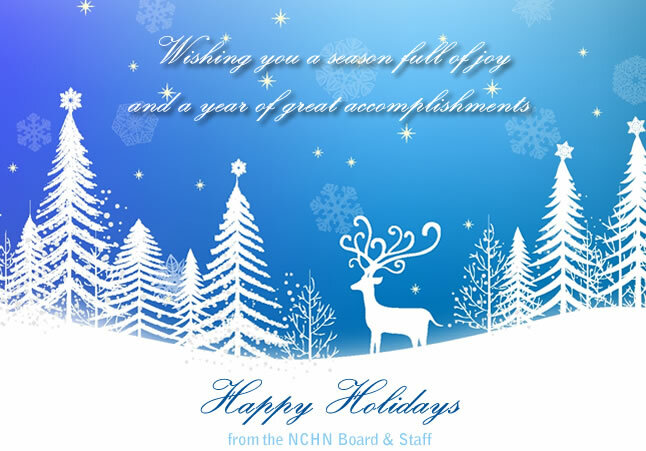 Please make a note of the address change with your accounting office for future mailing of checks to NCHN. Rebecca’s email address will remain the same, but a new number will be published after the first of year. NCHN is now offering discounted rates on professional grant review services for your next federal grant proposal. The Grant Coaching & Review service connects members with an approved grant coach at a pre-negotiated, discounted rate. The grant coach will provide critical review and editing services to NCHN members that are working to submit and win federal grants. Look for more details in your inbox later this week. Boards and leaders of networks recognize that they require multiple stakeholders for successful and fully engaged collaboration. What is often overlooked in the hectic nature of everyday business is the identification of these stakeholder groups. It is also essential to determine the unique needs of each stakeholder and the benefits they each expect and anticipate. During the January ER call, we'll identify primary and secondary stakeholders in Networks across the country and, consider the specific needs and benefits for three of these stakeholder groups. Join Dr. Mary Kay Chess on January 13, 2015, for our conversation in this third ER session on the business of successfully leading your unique Network through stakeholder engagement. Call in information was distributed through a Save the Date. If you need details, please contact Rebecca. EMTS: Request a free expert evaluation of your capital equipment purchasing strategy.